Say hello to your new favourite Summer pie! Peaches and blackberries are a match made in heaven. Sweet peaches are made even better by the pop of flavour that tart blackberries bring (I'm a huge fan of tart things! ), and be sure to add a scoop of ice cream on top to really take this pie to the next level. Now, social media is sometimes the worst....but sometimes it's the absolute best. I had followed Kristie from The Sweet and Simple Kitchen on instagram for a while now, and a couple weeks ago she messaged me asking to have a baking date! It was reminiscent of my very first insta-friend meet-up with my now good friend Amy, minus the sleepover that Amy and I had. Ha! It was friendship at first sight when I opened my door at 8am on Saturday morning (yes we're both a little crazy! haha), and we instantly bonded over our love for food, good brunch places, photography, instagram craziness, and stories about dumb boys...haha. Kristie is seriously as sweet as she looks on her instagram, and I am so excited about our new friendship. Seriously, the shy introvert in me was so nervous have another blind baking date, but it was amazing! 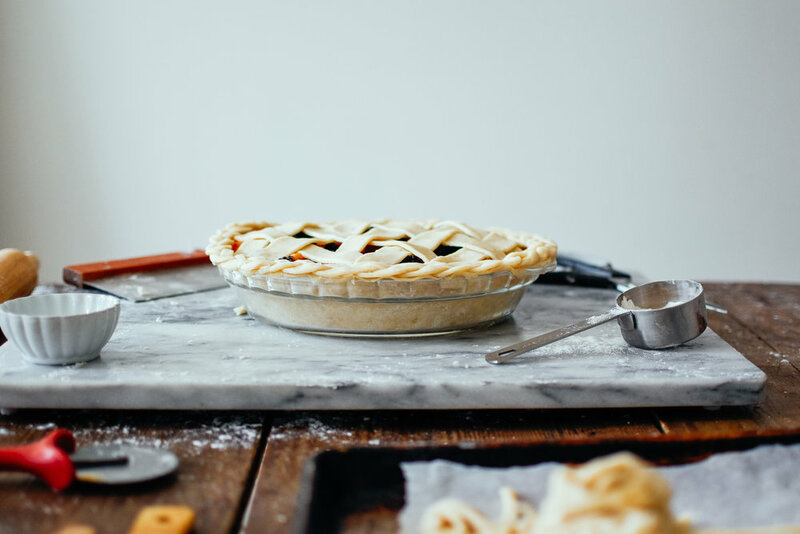 We filmed a tutorial for this peach pie, and it can be found on my instagram stories in the highlight section, along with a separate pie Q & A video series we did answering the most commonly asked questions we get about how to get the flakiest, prettiest, tastiest pie! One question that a ton of you asked was how to avoid soupy pie fillings! (These also contribute to the dreaded soggy crust crisis!) Whenever you're dealing with a very juicy filling (think berries, cherries, super juicy stone fruit, etc), it's a good idea to cook the filling before baking the pie. For this pie we let the cut peaches sit in a strainer with the sugar for about 20-30 minutes. It juiced like crazy, and we then took the juice and cooked it with a bit of cornstarch until it thickened up, and then added it back to the fruit and placed it in our pie crust! Total lifesaver. *I first saw that tip on Zoe Bakes instagram! She is a genius. In a medium bowl, combine the flour, salt, baking powder, and brown sugar. Add in cold butter, and use a pastry blender, fork, or a grater (if butter is frozen), to cut in the butter. You want the butter to be in pea-sized pieces. I like to work it with my hands to break the chunks up at the end as you don't want them to get too small. Place 2 teaspoons vinegar into a liquid measuring cup. Add enough cold water until it equals 1/2 cup total. *I will do this at the start of the baking process, and place in the freezer to really cool down. Pour water mixture over the flour-butter mixture. Use a spatula to stir mixture. Once the dough has started to come together, turn out onto a lightly floured surface. The dough will look very shaggy and flour-y at this point, that's just right. Very gently work with your hands to bring the dough together a bit more. I scoop up the flour bits, place them on top of the dough, and then fold them in. The goal is to work the dough as little as possible. Overworking the dough causes more gluten development to form, and we don't want that to happen as it causes your crust to be tough! Peel peaches by placing them in a pot of boiling water for 2-3 minutes, and then removing and placing in an ice bath. The skins will simply rub off! In a large bowl, stir together the peach slices, blackberries, and sugars. Place everything into a large strainer, and set it over the bowl. Let the fruit sit and juice for about 20-30 minutes. Give it a gentle stir once or twice during this time. You should notice that juice is draining into the bowl. Place the juice into a small saucepan, and add in cornstarch while the juice is still cold. Stir together until cornstarch is dissolved. Heat on medium low, stirring constantly, until juices thicken up. Pour thickened juice back over the fruit, and it is now ready to add to the bottom crust. Let your pie dough rest on the counter for 10-15 minutes before rolling it out. If you try to roll it out and it starts cracking, simply wait a bit more and try again. Roll out your pie crust and place into a pie dish. You want to have an inch or two hanging over the edge of your pie dish so that you can crimp it after. Add filling, and place into the fridge while you roll out the top crust. If you want to do a lattice, or braids, I like to place things onto a cookie sheet as I work, and place it in the fridge if the dough starts getting soft. In summer it can be challenging, so give yourself lots of time, and don't be too hard on yourself if it doesn't work out! Honestly a plain double crust with a few vent holes (small knife cuts on the top) tastes the best to me! Place the finished pie into the freezer for 15-20 minutes before baking. This helps your crust harden up again and not get mushy. Remember, cold dough means cold butter = flaky crust! Preheat your oven to 425 degrees F while the pie firms up! Brush pie with egg mixture (or milk), and sprinkle with coarse sugar for some extra sparkle. Bake at 425 for the first 15 minutes, and then reduce the oven temperature to 350 degrees F, and bake for an additional 40 minutes, or until pie is brown and bubbling well. *If crust is getting dark, especially around the edges, you can make a protector out of aluminum foil. This is best done before the pie goes into the oven! Simply lay foil over chilled pie, lightly crimp edges, then remove and cut a whole in the middle. You'll want about 1 to 2 inches in from the edge protected. Remove foil and use if needed. Let pie cool almost completely before cutting (usually 2-3 hours), otherwise you'll have a runny mess. Still delicious, but the filling will likely note be quite set. My rule of thumb is that you want to be able to comfortably place your hand on the bottom of the pan. Serve with ice cream for best results. Pies are always best the first day, but will keep several days on the counter. I also cut mine up and freeze the individually pieces if I can't eat it fast enough. Let it thaw in the fridge when ready to eat.